Newlyweds Anushka Sharma And Virat Kohli React To The Congratulatory Tweets! 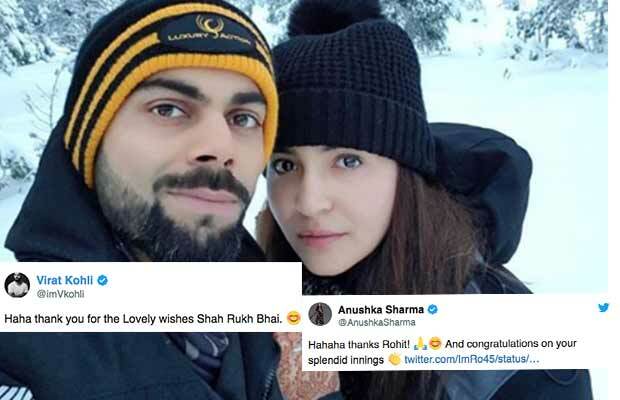 Home BOLLYWOOD Newlyweds Anushka Sharma And Virat Kohli React To The Congratulatory Tweets! The newlyweds Anushka Sharma and Virat Kohli react to the congratulatory tweets post-wedding celebrations! Finally Bollywood actress Anushka Sharma and Indian Cricketer Virat Kohli have entered holy matrimony! The power-couple tied the knot after being in a relationship for about four years. Their high profile relationship gathered many eyeballs since the beginning so why should their wedding be any different? Anushka-Virat got married in Tuscany, Italy in an intimate ceremony with their families and close friends in attendance. The very hush-hush wedding came as a surprise to many! Since officially announcing their nuptials, congratulatory Tweets and messages have been pouring in from around the world! The couple has turned to their Twitter to thank everyone that congratulated them! Haha thank you for the Lovely wishes Shah Rukh Bhai. ? Thanks for the lovely wishes Ayushmann. ? Thank you Shami, jaldi milte hain ? Thank you so much Bhajju Pa ??? Thanks Jinx, looking forward to some tips from you. ? Thank Ash, see you soon! ? Currently, the couple is honeymooning in snow clad Europe. In the picture posted by Anushka, we can see the couple enjoying the snow! Anushka and Virat are expected to return before their December 21st reception in Delhi. The Delhi reception will be held for their relatives. Another grand reception will be held in Mumbai on December 26th for their industry peers. Post their receptions the couple will ring in their New Year in South Africa. There Virat will be prepping and playing for the South Africa vs India ODI Series. Whereas, Anushka will be returning to Mumbai to resume filming for Aanand L Rai’s upcoming untitled movie starring Shah Rukh Khan. Previous articleMallika Sherawat Faces Eviction From Her Paris Apartment For Not Paying Rent?